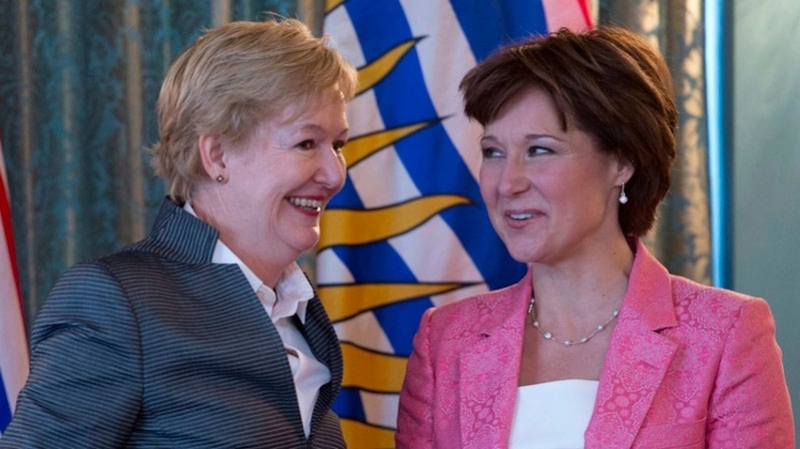 BC Justice Minister Suzanne Anton and Premier Christy Clark in Victoria in June, 2013. File photo by The Canadian Press. Justice Minister Suzanne Anton says the code will be changed to include "gender identity or expression" among the protected grounds its covers. Premier Christy Clark was excluded from the parade last year after the Vancouver Pride Society required all those participating to sign a pledge supporting transgender equality legislation. The government had said that all individuals were equal under the law, so no changes were required, but Anton says she has decided to act after many meetings with people from the LGBTQ community. Spencer Chandra Herbert, a Vancouver New Democrat member of the legislature, asked for the changes in private member bills and says the amendments will make it clear that discrimination against someone because of their gender identity is unacceptable. Anton says she will march in Vancouver's parade on July 31, but added that the premier will be away and will instead take part in Kelowna's pride celebrations.